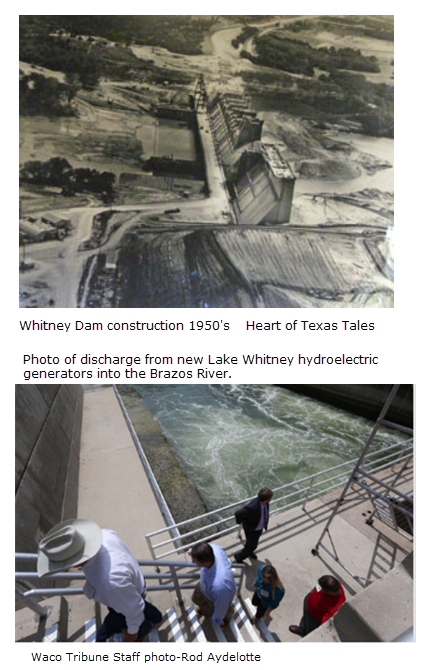 ​​​​​LAKE WHITNEY, HILL COUNTY – ​​​​A ceremony with U.S. Army Corps of Engineers officials capped a decade-long effort to renovate the last remaining hydropower facility on the Brazos River—Lake Whitney. ​The new Toshiba turbines are rated to produce up to 43 megawatts, replacing the original Allis-Chalmers units that could produce no more than 30 megawatts. The new units are more efficient and can be turned on much more quickly to meet sudden surges of electrical demand in the grid. That nimbleness also could create a hazard for recreational users who fish and paddle just downstream of the dam, said Lake Whitney manager Abraham Phillips. In the past, three alarms would sound before water was released from the dam, giving users a 15-minute warning. But now, recreational users near the dam should be prepared to seek higher ground immediately after a single siren, Phillips said. ​Check out ​True Tales of Hill County for more on Lake Whitney.